Weather stations are really cool, but maybe you just don’t need something that complicated. Would you be interested in having the outside temperature showing to you inside your residence? If this is you, then this is just what you are looking for. 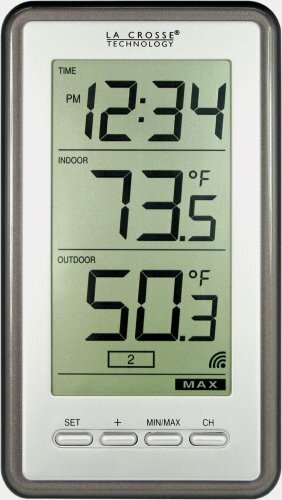 The La Crosse WS-9160U-IT digital thermometer should fit the bill for you. If you are shopping for a very good and reliable inside/outside weather thermometer this model from La Crosse is a great choice. The monitor hangs on your wall, where you can easily glance at it and see very clearly the time and the inside/ outside temperature of your location. If I have your attention so far, then read further as I take a detailed view of this digital weather thermometer. This is a digital thermometer with wireless remote connection and a clock. You can use 3 remote sensors with this base monitor unit, so you can be seeing what the temperature is is three different places around your house or property. These remote sensors are optional and must be purchased separately. The unit does come with one remote sensor but you must purchase separately the other 2. Also please be aware that dashes before the temperature readings mean the connection is lost between the Temperature Station and the outdoor sensor. The display shows and records daily high and low temperature. In order to access these temperature readings, you must press on the MIN/MAX button to toggle button to between MIN and MAX settings. You will see the letters MIN display in the lower left side of the screen and you should see the temperatures change accordingly to show the minimum temperatures. Then you will need to toggle this display the MAX settings where the maximum temperatures are to be read. You may have to toggle the MIN/MAX button several times to go from MIN to MAX. A couple of other things you should know. The thermometer system may be used in any number of ideal locations for you. Such as an RV or a boat or a playhouse, a lake cottage or maybe even a hunting lodge. Just some ideas. The unit is run on batteries and with its size, it is very mobile to use. The display colors are as such. The front is white, the edges are black, and the back is all black as well. The sensors are mainly temperature sensors. Here is the range of their sensitivities. This would be a good place to mention to be very cautious in buying extra remote sensors to use. You need to make sure the sensor that you buy to use also transmits in 915 MHZ. Many sensors look like what you need, but the transmission frequency is not the match that is needed. Please read the specs on what you are purchasing to make sure they match up. It says on the outside of the box that it is manufactured in China. The Display/Receiver uses 2 “AAA” Alkaline Batteries. They are not included with your purchase. The Remote Sensor uses 2 “AA” Alkaline Batteries. They are not included and you should consider seriously using Lithium batteries so you have a much longer life. Using Lithium batteries will also ensure no non-working time. When looking at this digital thermometer, the things that really stood out to me are the following. If you are thinking of purchasing this digital set from La Crosse please be reminded that this is not listed as a weather station. This is a really neat (cool) thermometer. What is the difference you may be asking? You may have seen or heard a friend talking about theirs and the things it can do, and the information you are supplied. Please look at this as only a one tool weather unit. It will do a great job of giving you the outside/inside temperatures. That is it, you will not be getting wind speed nor relative humidity, nor wind direction. Secondly, you need to know that this will do the job for you but for how long no one really knows. Some people talk of having it work for up to 7 years. But then many more will say theirs worked for anywhere between 2-5 years. Why the difference who knows? One could suspect critical elements would be how and where it is used by the customer. Please follow the directions for the best results. In reviewing many other La Crosse products it seems that they are popular, perform well, and people are repeat customers. It appears many customers have purchased this unit many times because they are very satisfied with the model. My overall view of this digital thermometer is that it is worth the money just from a fair price perspective. For the over $20 and Under $30 price point, you will be receiving the digital thermometer, one remote sensor and the promise of receiving the outside temperature from a location outside. This will work as an excellent starting point for all fun weather observers. Before I leave to do activities, I ask myself, what is it like outside? Hot or Cold? So to the casual weather person it works. If you want to branch out by adding other remote sensor locations it will be around another $20 for each sensor alone. So looking at that, the original purchase is a good deal. This is the number 1 seller for outside thermometers on Amazon, and there are reasons it continues to sell so strongly. The fair price for the quality is what I would consider the biggest reason for buying. Just make sure you will be really happy with just the temperature readings. If you are considering a unit with more options then maybe check out these simple weather stations we have reviewed. La Crosse Technology's WS-9160U-IT product set up guide. Please comment below with questions or concerns.